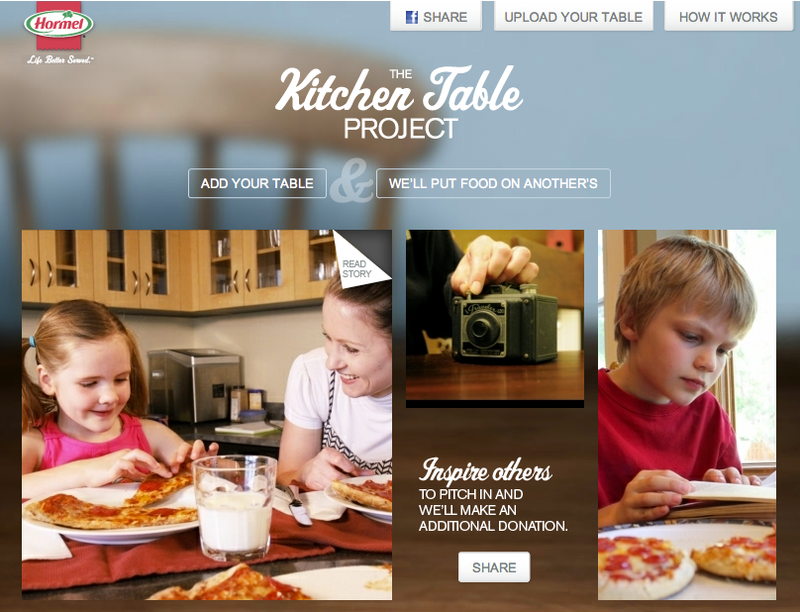 Hormel Foods Corporation has announced a new cause marketing initiative called the Kitchen Table Project, which will give fans a chance to donate to Feeding America via Facebook. For each photo of a fan’s kitchen table and its story uploaded, Hormel Foods will donate $1 worth of products to Feeding America. When fans share their photo and story with friends on their personal Facebook page, Hormel Foods will donate an additional $5 worth of products to the organization. The project will run for a maximum of three months or until the maximum $100,000 worth of product is donated. We’ll be interested to see how much traction this campaign garners on Facebook. While uploading a photo of a kitchen table doesn’t seem like a big ask, in today’s attention-deficit society, the process of taking the time to snap a photo then uploading it to Facebook is on the more involved end of the engagement spectrum. That said, the application is well-designed and visually appealing, providing real time updates of donations earned.